David Boudia (Noblesville, Ind./West Lafayette, Ind.) and Steele Johnson (Carmel, Ind./West Lafayette, Ind.) won the bronze medal in men’s synchronized 10-meter Wednesday at the FINA Diving World Cup, the top international meet of the 2014 season. Boudia and Johnson scored 414.12 points to finish third behind China’s Lin Yue and Cao Yuan (494.46) and Germany’s Patrick Hausding and Sascha Klein (444.78). 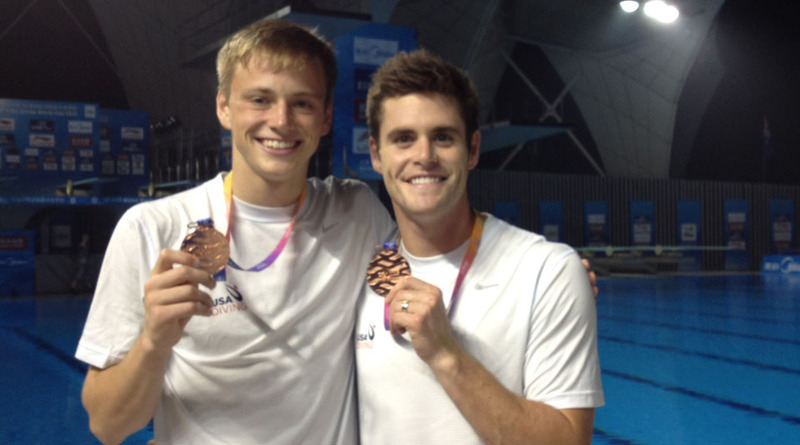 It was the first international competition together for Boudia and Johnson. “We’re a new synchro team. Steele and I have never done 10-meter synchro together at a major competition before. I thought we dove solid, and this is a good stepping stone for the next two years,” said Boudia, who won Olympic bronze in 10-meter synchro with Nick McCrory two years ago in London. The Americans were in a close contest for the bronze medal, sitting in fourth place behind China, Germany and Mexico through four rounds, but just 2.31 points separated third from fifth with two rounds to go. Boudia and Johnson scored 79.92 points on their front 4 ½ tuck in round five, while Mexico’s German Sanchez and Ivan Garcia went for the difficult inward 4 ½ tuck but came up with just 63.96 points to allow the U.S. pair to move into the bronze medal position. The Americans closed out their list with 77.76 points on a back 2 ½ with 2 ½ twists to finish with 414.12 points, edging Cubans Jose Guerra and Jeinkler Aguirre by 3.36 points for the spot on the podium. “This was a good milestone for us. I’m super excited to be partnered with David. I just want to do the best I can every time I dive with him,” said the 18-year-old Johnson, who is competing in his first World Cup.